Easter Day was forecast to be rainy and we decided to stay put at Cropredy and so celebrated Easter at Cropredy’s parish church, St Mary’s. It was their informal family friendly service led by two lovely ladies, we were made welcome and given a small egg as we left. The forecast was about right and the heavens opened after lunch so we had made the right decision to stay and whiled the afternoon and evening away with TV and Scrabble. A brood of 13 duckings can they all be hers? This morning’s weather obliged with sunshine, after breakfast Joy prepared our meals for the day and then we joined the exodus of boats heading South. A few of Cropredy Canoe Club’s members were out and about but there were, it seemed, few boats leaving Banbury so consequently most of the locks were against us. At Little Bourton Lock the owner of the lock cottage was engaged in renovations and opened the top gate for us. Below the lock the Anglo-Welsh hire boat which we had seen broken down on Thursday was now running again (diesel problems cured we understand) and we were told that the company was looking for someone to take it back to Oxford as the hirers had had to abandon their trip because of the breakdown. The sunshine stayed with us all the way back to Banbury where we paused to pick up a prescription from Banbury Health Centre (yes, open on a Bank Holiday Monday!) At Banbury Lock we met Jim on Smokin’ Badger who told us he is setting up a mobile fuel tank cleaning service after experiencing fuel bug problems himself three times in the last year. 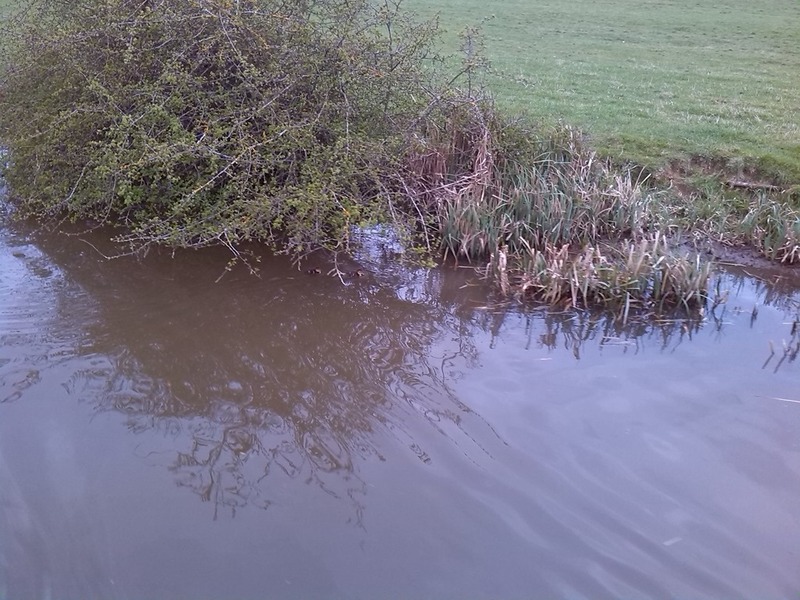 We arrived back at our home mooring to learn from a passing boater that he had just seen a mountain bike being stolen from a cruiser moored nearby. We managed to trace the owner through Jim to pass on the bad news. If you are in the Banbury Tramway area beware of a shifty looking hoody wearer loitering about. We were just in time for a cup of tea and a chat with the neighbours in the sunshine before a thunderstorm developed and sent us scurrying inside. It’s back to work on Wednesday with the prospect of our next trip to look forward to. Tuesday afternoon we headed back to Banbury in more glorious weather making it back to our mooring by teatime. On Wednesday I borrowed a pressure washer from a colleague and washed the roof down to get rid of the winter’s grime while Joy washed and polished the side. We then bemused passing boaters by reversing down to the winding hole, turning round and reversing back again so we could wash the other side. Then of course the grass cutting contractors came along and disrupted our plans, Joy moved the hose out of the way for them but they simply bypassed our mooring. Joy was having none of this and tackled them as they came back and they obligingly cut our patch too. Their response was that they usually don’t cut the grass when people are on their boats??? Wouldn’t it be better just to ask the mooring holder if they want the grass cut? Joy had offered her art class a boat trip on Thursday to do some open air painting down at Nell Bridge but on the morning none of them wanted to come, preferring to travel there by car, so rather than waste the day off I had booked to make the trip, we opted to start the second part of our cruise a day early. As we approached Samuelson’s Bridge we met nb Eileen and later found that Wrens-Nest is in one of their blog’s photos. They write about an unfortunate incident which occurred shortly after, hope the hand gets better soon Claire. 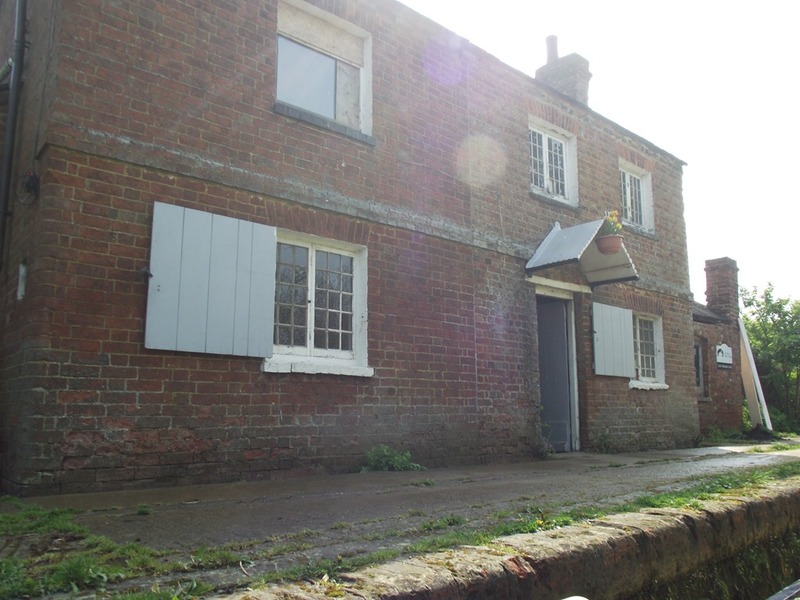 We easily reached Cropredy & spent the night there and carried on to Fenny Compton on Friday where we had to visit The Wharf Inn, of course, to quench our thirst and stock up at The Spice Traders stall there. As we were having our drinks Rob Totterdell, the stall’s owner appeared and we had a long chat, Rob’s a really interesting guy and sources his products from small companies, keeping it as local as possible. 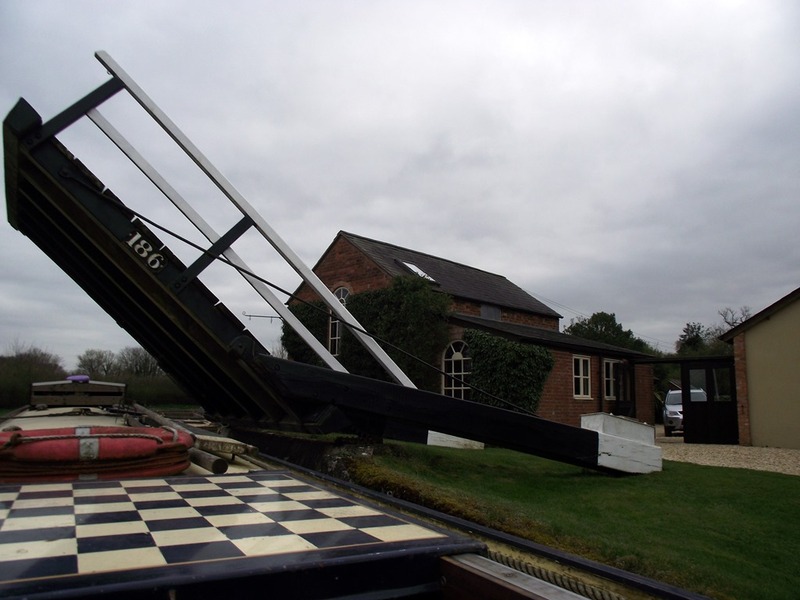 We had intended to stay there for a few days but the forecast for Sunday was not encouraging so we decided to head back to Cropredy today and get most of the locks out of the way. Cropredy Marina is pretty full with boats now, it was just a hole in the ground last time we passed and looks really good, in fact we met two boats on their way to moor there. Tomorrow is Easter Day and we wish you all a very Happy Easter. After completing my task at Lower Heyford we started on our return northwards after work on Friday (no more work for 12 days!) 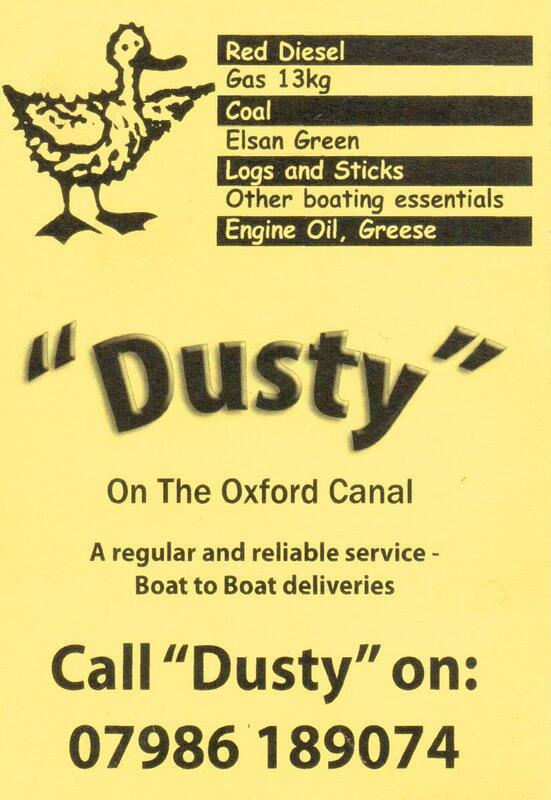 but only a short hop to the other side of Lower Heyford where we moored up behind friends on Prancing Pony to fit a new alternator regulator for them which I had ordered before they left Banbury. It’s a lovely, peaceful spot at which the noise of the train traffic is muted, unlike last week where we could hear and feel the goods trains roaring past all through the night. 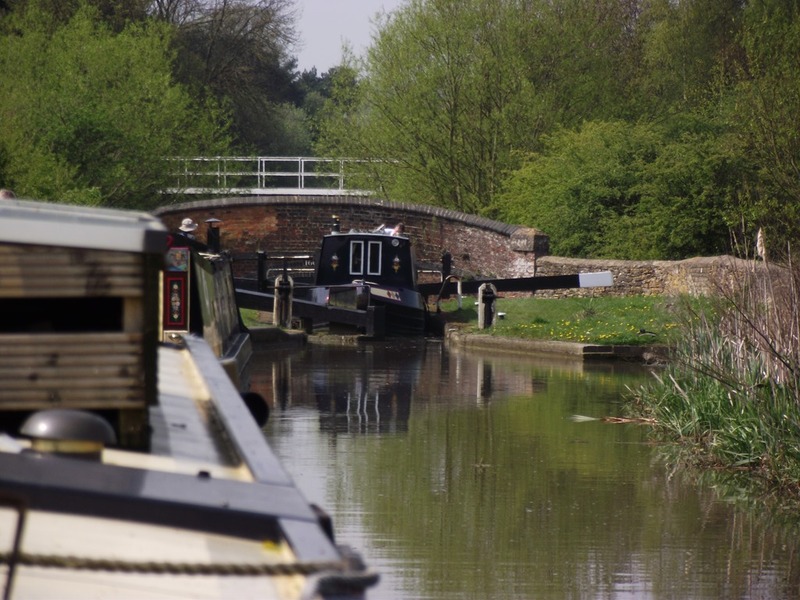 On the Saturday it was onward to Upper Heyford, as we had arranged for our friends, Toni & Chris to come to dinner and Allens Lock was a convenient place for them to meet us. We enjoyed a convivial evening together and enjoyed the lovely gardens of Willow Cottage which extend down to the canal’s edge. 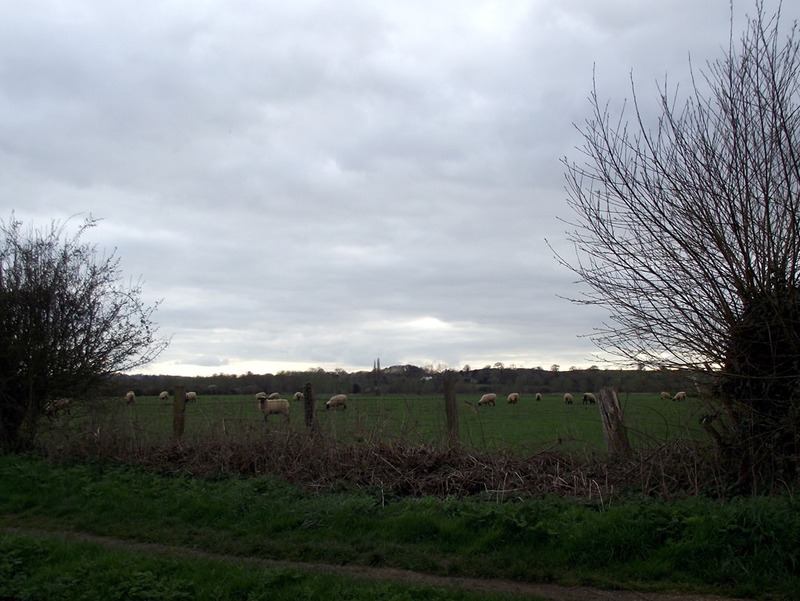 We stayed here for a few days as we wanted to go to our church at Heyford Park on Sunday and Joy’s exercise class at Upper Heyford Village Hall on the Tuesday and there again it’s an absolutely beautiful spot. Years ago there was a water mill on the river adjacent to the lock. Monday saw me servicing the boat engine before we headed off again on Tuesday afternoon and the changing of fuel filters and removal of muck from the water trap seems to have solved the problem of the engine not picking up speed properly on starting up. I also exercised my brain and rearranged the wiring to the front battery bank so now I can see how many amps is going into that set of batteries too. Installed a small solar panel system on a narrowboat to keep the batteries topped-up through the summer when not cruising. Is this the start of the Cruising Season? I suppose it must be as there has been a marked increase of boats passing our mooring this last couple of weeks and after work this afternoon we joined that happy band and headed off South. The reason for the journey is that I have an appointment to fit a solar panel system for someone at Heyford and it’s so much easier if I have my back-cabin workshop alongside. Not only that, but we are meeting up with number one son plus grandchildren tomorrow. We were approaching Nell Bridge Lock when we spied a familiar boat moored up, The Good Ship Bones! We tooted as we passed but no one seemed to be at home, however as we came through the adjacent lift bridge we were hallooed by two approaching figures, Bones and her neighbour Alex. These kind folk helped us through Nell Bridge Lock and then walked down with Boots the dog to see us through Aynho Weir Lock as well. 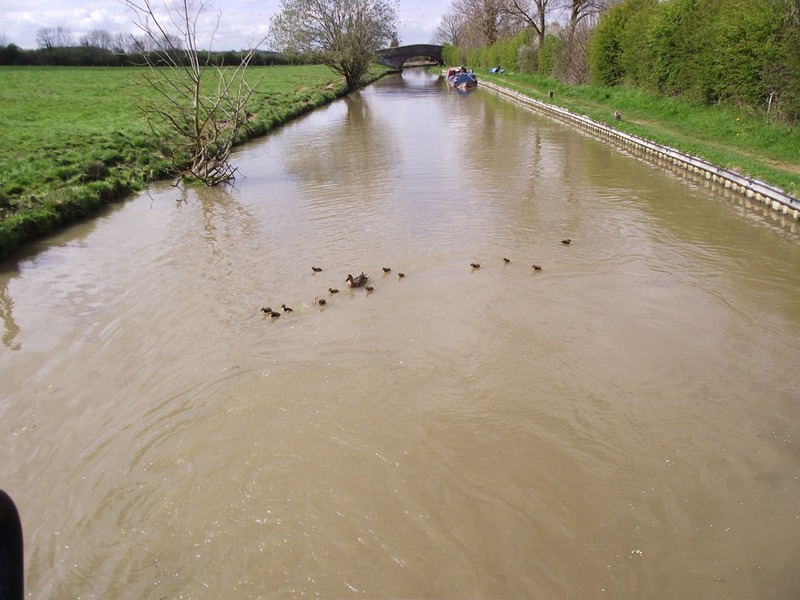 After getting out of the shallows where we had landed up, we went on down to Aynho Wharf, spotting our first ducklings of the year, and moored up for our tea. We shall stay here tonight and complete our journey tomorrow.